Bob and Susan Matthews began attending St John’s in 2012, following Bob’s retirement from a career in commercial banking. Bob and Susan are active in our ushering ministry, and Bob is a regular in our Acolyte and Lay Reader ministries. He is also a regular attendee at weekly Men’s Bible Study meetings. Bob served two years as Stewardship Chairman, and he currently serves as Chairman of our Finance Committee. He can hardly remember a time when he has not served on or chaired a church finance committee since the mid-1980s. Bob is retired from Commerce Bancshares, a regional commercial banking company with total assets in excess of $25 billion. The company is headquartered in Missouri with branches in most surrounding states and beyond. 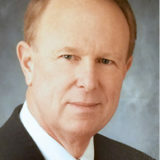 He was at Commerce for 42 years, serving in a variety of capacities, including as a Director of the banking and other subsidiaries, a member of the Company’s Executive Committee, and a short stint as a Director of the publicly traded parent company. During the last 22 years of his career he held the position of Executive Vice President, Chief Credit Officer, and Chief Risk Officer. He was elected for a three year term to The Risk Management Association Board of Directors, the premier risk management trade association for national and international banking companies, world-wide. He continues to serve on the Board of Directors and the Audit Committees of life insurance and premium finance companies in Kansas City.